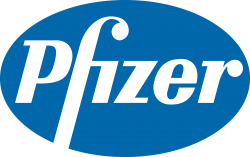 Pfizer Inc. is an American pharmaceutical corporation headquartered in New York City, with its research headquarters in Groton, Connecticut. Pfizer is considered one of the world's largest pharmaceutical companies. It is listed on the New York Stock Exchange, and its shares have been a component of the Dow Jones Industrial Average since 2004. The company develops and produces medicines and vaccines for a wide range of medical disciplines, including immunology, oncology, cardiology, diabetology/endocrinology, and neurology. Email me jobs from Pfizer Inc.